On Saturday I drove my family from Las Vegas to Salt Lake City, wherein we spent four hours at IKEA, and had a very improbable run in with a couple we knew from Las Vegas who themselves had recently moved to SLC. After a healthy shot of meatballs, I loaded the RV I had rented with seven Billy bookcases (81 lbs each) a five drawer chest, a high chair, and other assorted IKEA odds and ends. Then, seemingly for the hell of it, I drove to Boise. Seventeen hours and eight hundred or so miles later, we all arrived at our new home. I immediately unloaded the RV and went to sleep. Sunday I spent clearing an inch of ice from my new drive way. Today, I assembled IKEA furniture, installed a thermostat, and ruined some frozen pizza. All of which is little more than a long excuse for why there was no update earlier today. Also, we don’t have a new comic yet. It’s coming though, and to prove it, I’m going to show you some of the preliminary artwork Seth has handed in for the next story. A few months ago I sent Seth the script for the new story, titled Infestation. Less than 20 minutes later Seth replied that he had only read the first half of the first page, and that he was in. The next day he had sent me some questions about character design, and noted that he still hadn’t read more than a page of the script, but his excitement was growing. The next day he sent me this drawing. The guy was jazzed. 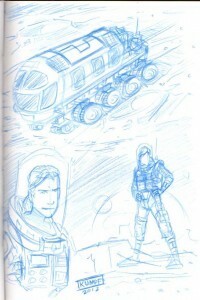 He hadn’t even finished illustrating Corner Shot, No Magic, and he hadn’t read hardly any of the script for Infestation, but he couldn’t stop talking about illustrating a space adventure. As you’ll see, eventually, his excitement paid off.